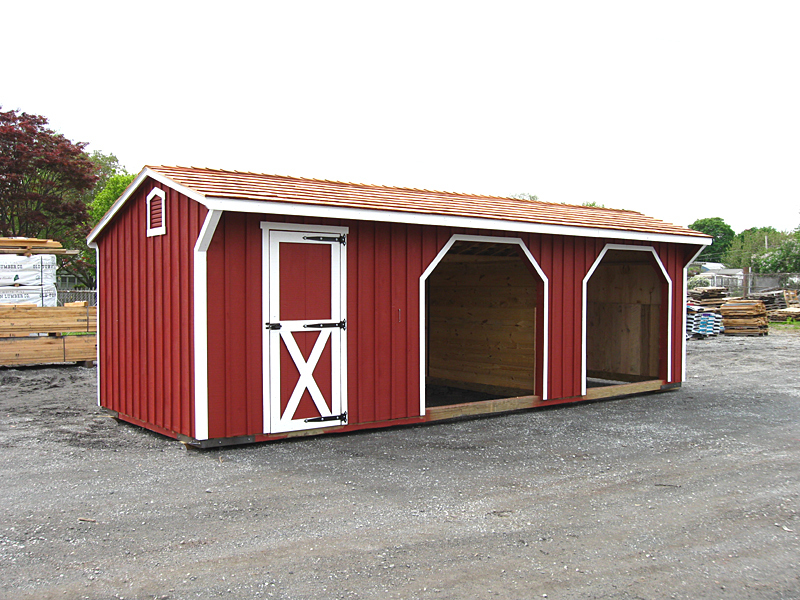 A three sided shed with an open front that provides horses and other farm animals with a temporary shelter from weather elements. 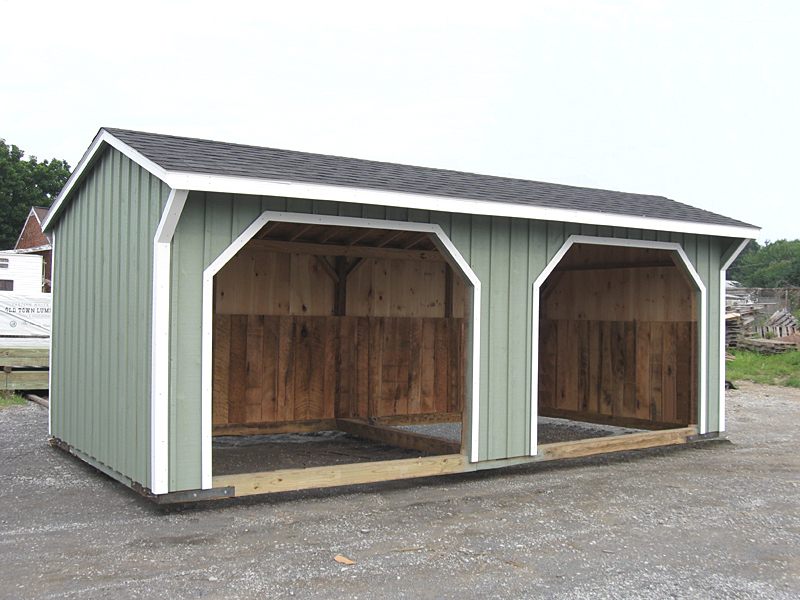 Size limit - Due to oversize delivery limits & regulations, prefab run in sheds are limited to 14' in width and aroun 11' in height. Most of the sheds built are either 10' or 12' wide. 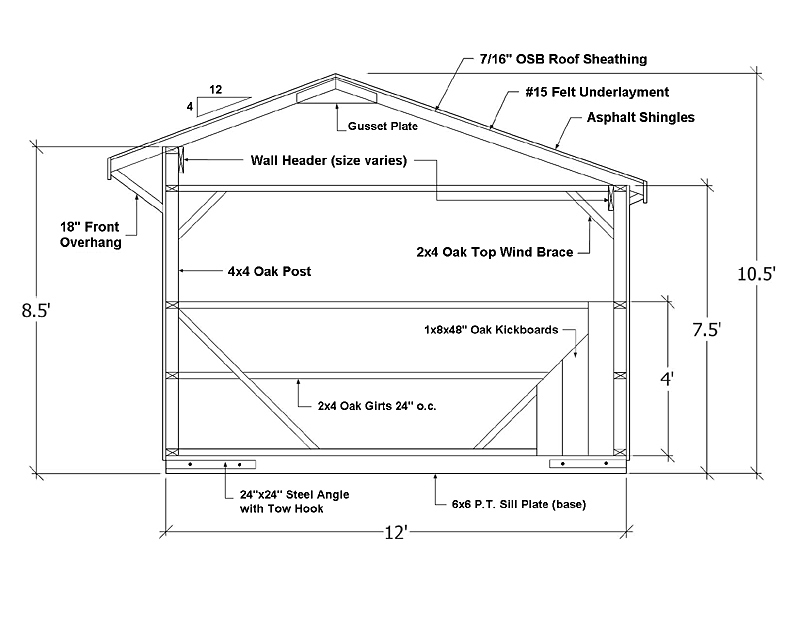 Roof overhangs add additional 2' to the total width of the shed. 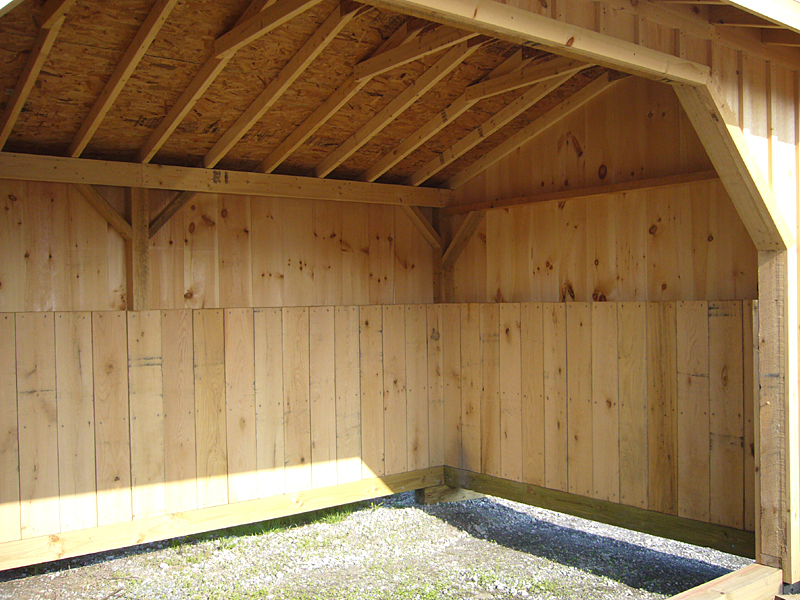 Average wall height is anywhere from 7.5' - 9' high which may not be high enough for very large horses. Site Access - In order to deliver a fully built prefab shed, you must have good access for truck & trailer to get into your place, unload the building and turn around. 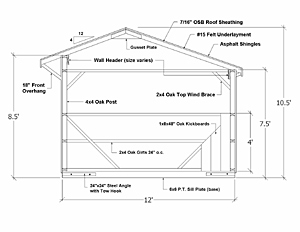 In addition, your gate must be wide enough to pass through with the building. Lately, however, many shed haulers started to use special machine called a Mule. This machine makes it easier for shed hauler to manuver and put the building in place. See how this machine works: Shed Mule. 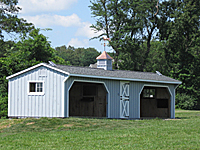 Most portable horse sheds, such as Run In Sheds & Shedrows are built with either Yellow Pine or Oak framing material. The siding can either be metal, pine, cedar, textured plywood, Duratemp, etc. 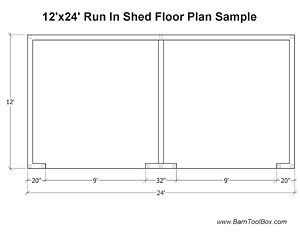 As seen from this image, most of portable horse sheds are built on top of 6x6 pressure treated skids (sill plates) with a steel tow hook installed at each corner. 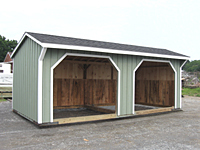 This enables shed manufacturers to deliver them on flat bed trailers and to provide a good base for the shed itself. 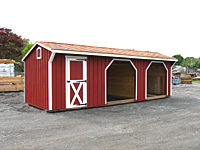 Once the shed is delivered, it can be placed right on top of the ground, or crushed stone base. 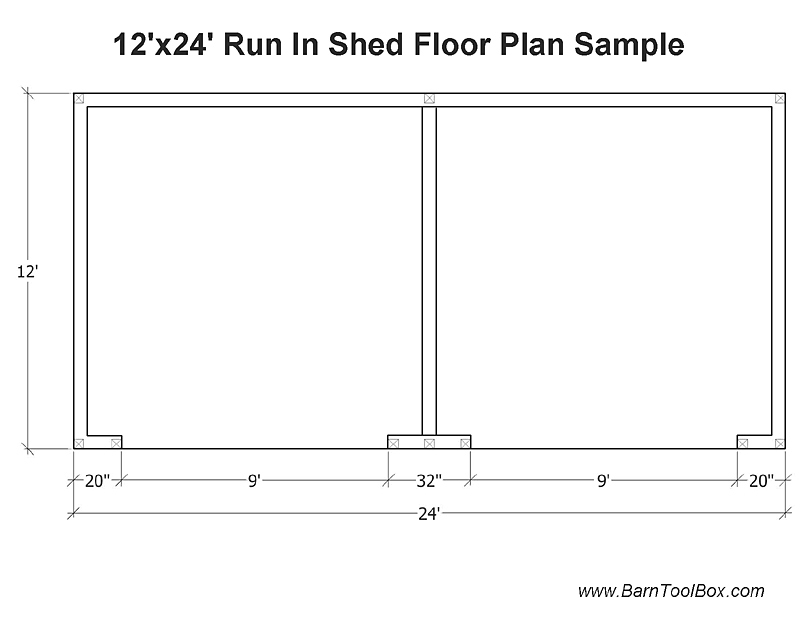 See also Run In Shed Framing Details sample.